How Do You Find This Shakey's Job Posting? Home / business / news / photo / social media / viral / How Do You Find This Shakey's Job Posting? 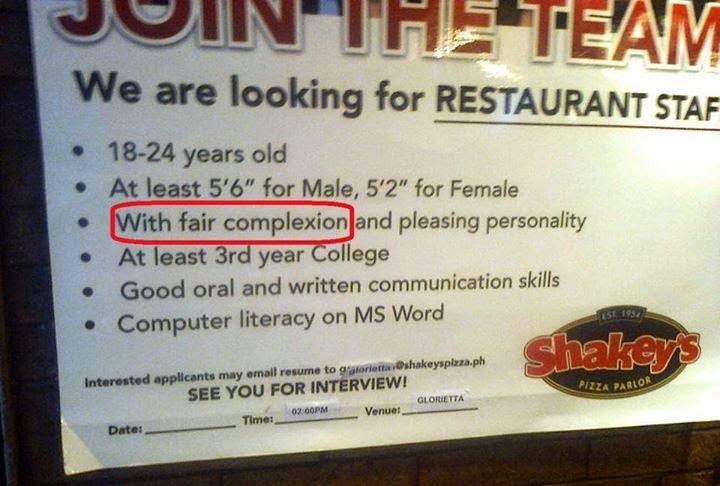 A netizen spotted an announcement that says a branch of pizza restaurant chain Shakey's is hiring. What shocked her is the content of the job posting. Today, my dad & I came across something very disturbing. There was a sign posted in Shakey's Glorietta looking for people to join the restaurant staff. Unfortunately, one of the qualifications is that the applicant has to be fair. This is very disappointing, especially living in the Philippines where most of the population comprises of people with olive and brown complexions. How does the skin color even have anything to do with being a good restaurant staff? So now anyone with a dark complexion is deprived of a work opportunity? I found this sign very derogatory and insulting. I hope the Shakey's management can do something about it soon. — feeling disappointed"
Her FB friends and followers expressed mixed reactions. Some described the job hiring announcement as "discriminatory." Shakey's has yet to comment on the matter. How do you find the job posting?